We've listed our Cheshire Oaks hotels by their distance to the popular McArthurGlen Cheshire Oaks Designer Outlet Village near Ellesmere Port, close to Chester. 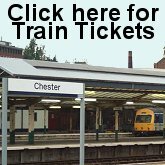 There's a bowling alley, cinema and a night club to keep you entertained at night, whilst Chester is only 6 miles (15 minutes drive) away. The Boat Museum and the amazing Blue Planet Aquarium are also next to the retail park, whilst Chester Zoo, Liverpool and Manchester are all within easy reach.